The Common Indian Myna was first introduced into Australia in 1862, to control pests. Since then its range has expanded up the eastern coast of Australia. Myna birds are commonly found in both urban and rural environments. Impact: Common Indian Mynas can be an economic problem because they damage fruit and grain crops and their noise and smell can be annoying in large numbers. Mynas can also spread mites and they have the potential to spread disease to people and domestic animals. 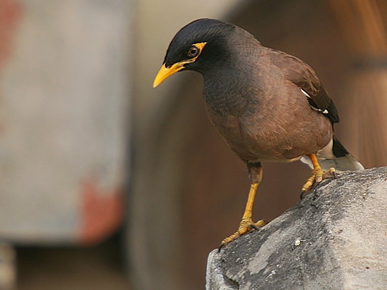 Indian Mynas compete aggressively with native wildlife for nesting hollows; they nest in tree hollows or places like them such as holes in roofs. They are also capable of evicting even large birds such as Kookaburras and Dollar Birds from their nests. The myna bird has been declared the second greatest threat to native birds after land clearing. In the year 2000, Common Indian Mynas were listed by the World Conservation Union as one of the World’s 100 Worst Invasive Species. The Common Indian Myna is a medium sized chocolate brown bird, about 12 cm tall, with a black head and neck, a yellow beak, eye patch, feet and legs. White wing patches are obvious when the birds are flying.